Consistently ranked among the top English departments in the world, ours is one of the largest, most diverse, and most vibrant departments at the University of British Columbia. 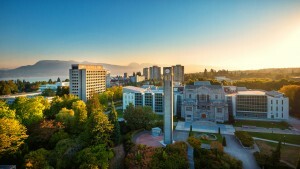 The department is unique in Canada by offering two tiers of programs in English Literature and English Language and Linguistics at the graduate and undergraduate levels. We teach courses in all of the literary historical periods (Medieval, Early Modern, Eighteenth Century, Romantic, Victorian, Modernist, Postmodern, and Contemporary), national, transnational, postcolonial, transpacific, and Indigenous literatures in English, as well as language, linguistics, rhetoric, critical theory, media studies, and a range of interdisciplinary topics. English department faculty, postdoctoral fellows, and graduate students are at the forefront of humanities and arts research. We lead and participate in several multidisciplinary research programs in the Faculty of Arts and beyond, including First Nations and Indigenous Studies, Science and Technology Studies, Asian Canadian and Asian Migration Studies, Studies in Race, Gender, Sexuality and Social Justice, Law and Society, Media Studies, Canadian Studies, and Medieval Studies. English department faculty have been vital to the founding and support of innovative programs such as Arts One, Musqueam 101, Humanities 101, Critical Studies in Sexuality, and Arts Co-op. Our faculty and students are involved in research networks at UBC, including Oecologies and Indigenous Pedagogies, and others hosted by Green College‘s interdisciplinary and public programs. We also participate in national initiatives like Early Modern Conversions: Religions, Cultures, Cognitive Ecologies, Canadian Women in the Literary Arts and Editing Modernism in Canada. The English Department is the home of the Dictionary of Canadianisms on Historical Principles, and a number of faculty serve as editorial staff for Canadian Literature, the leading journal in its field. As reflected in their field-leading research and publications, our department members are among the most productive in Canada. Our diverse expertise is well reflected in books published in 2014 and 2018 alone. We also work on collaborative research projects across the world, many funded by the Social Sciences and Humanities Research Council of Canada and other significant funding bodies, on topics such as ecology and literature, English linguistics, rhetoric and science, musical-textual improvisation, and narratives of migration. Many of our faculty are currently engaged in projects devoted to new and digital media and are pioneering their intersection with both established and emerging modes of humanities research. These and other similar projects serve as springboards for innovative thinking about classroom pedagogy and community engagement. Several members of our department have won Killam Teaching Prizes and 3M National Teaching Fellowships recognizing outstanding contributions to undergraduate and graduate learning. Our colleagues have also received national recognition for their scholarship by being named Fellows of the Royal Society of Canada and Officers of the Order of Canada. We believe in the value of public intellectual work and helping our students become informed public intellectuals in their own right. We believe that our diversity is our greatest strength; it is through our commitment to open, progressive, and innovative blending of research and teaching, theory and practice, history and futurity that we play a transformative role in the lives of our students and our region. Mon. – Fri., 8:00 a.m. to 4:30 p.m. Detailed Directions: A road map and detailed directions for Buchanan Tower can be found on Google as well as from this UBC Wayfinding Map.